2 To adjust tones for a specific color channel, choose an option from the Channel menu. To edit a combination of color channels at the same time, Shift-select the channels in the Channels palette before choosing the Levels command. The Channel menu then displays the abbreviations for the target channels—for example, CM for cyan and magenta. The menu also contains the individual channels for the selected combination. You can only edit spot channels and alpha channels individually. 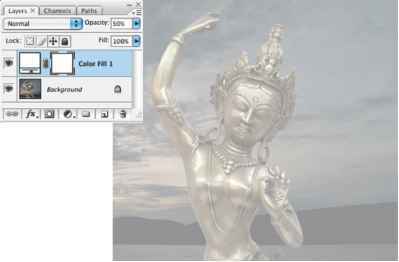 • Drag the black and white Input Levels sliders to the edge of the first group of pixels on either end of the histogram. You can also enter values directly into the first and third Input Levels text boxes. • Drag the black and white Output Levels sliders to define new shadow and highlight values. You can also enter values directly in the Output Levels text boxes.